URL on an official website on which this details was made available is – www.wbnsou.ac.in/student_zone/admissions/admission_information/admission_information_2018.shtml. Also, this is the last updated news on Netaji Subhas Open University till date. 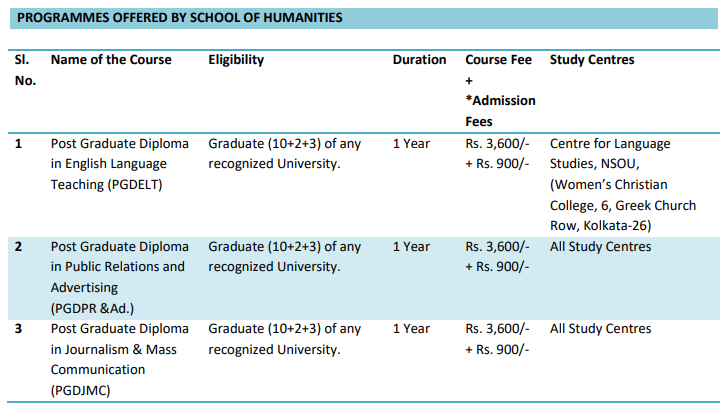 Admission Forms and Prospectus for all the programmes offered by the school of humanities i.e. Post Graduate Diploma in Journalism & Mass Communication (PGDJMC), Post Graduate Diploma in Public Relations and Advertising (PGDPR & Ad.) and Post Graduate Diploma in the English Language were made available at the respective study centres. Duration for all three courses is the same i.e. one year. Registration, NSOU unveiled a very important part to notice in University’s notification i.e. Post Graduate Diploma in Public Relations and Advertising AND Post Graduate Diploma in Journalism & Mass Communication are available at all the study centres. But, Centre for Language Studies, NSOU, (women’s Christian college, 6, greek church row, Kolkata – 26) is the only study centre where Post Graduate Diploma in English Language Teaching is offered. Why Netaji Subhash Chandra Bose’s Wedding Was A Secret Ceremony? Why Did He Hide It? Conspiracy Theories: What is the truth behind the death of Subhas Chandra Bose?